Please note that these products are sold in packs of five, so entering a quantity of '1' will mean one pack. Please note that these items are sold in packs of 5. Therefore, entering '1' into the quantity box when ordering will mean one pack of five blades. Jigsaw blade for cutting mild steel 3.0mm - 6.0mm and non-ferrous metal 3.0 - 15mm. 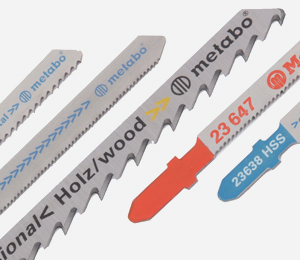 Jigsaw blade for cutting mild steel and non-ferrous metals up to 2mm thick. Jigsaw blade for cutting mild steel and non-ferrous metal 1.5mm - 4.0mm with a narrow blade for cutting curves.